Meet our UK Ambassadog – Bella! 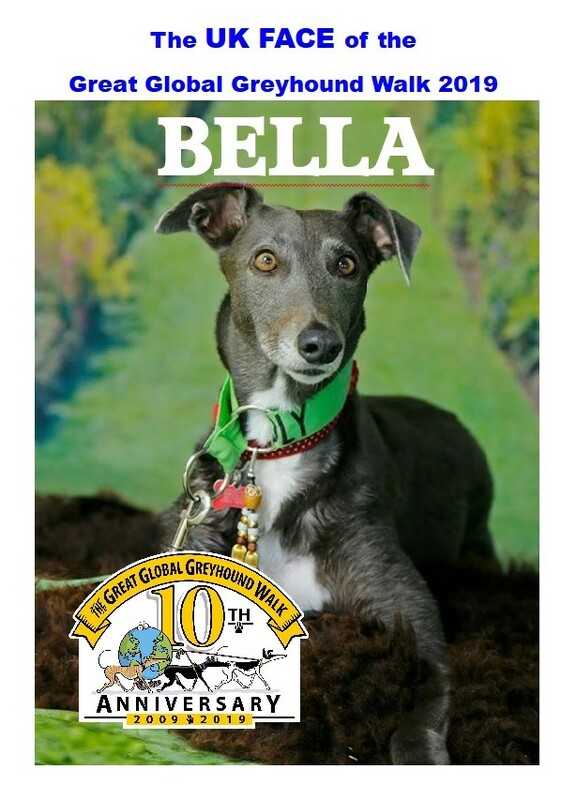 How lucky am I to be picked as the UK face of the very special 10th anniversary of the Great Global Greyhound Walk formerly the Great British Greyhound Walk and I am BELLA. Let me tell you all a little about myself. I am eight years old and I live with my two sisters Millie, Emi and my brother Echo, we also live with a horrible cat daisy, but she was here before me so my dad says I cant chase her. I have been one of the ambassador for Clarks Farm greyhound Rescue for the past 5 years, doing meet and greets dad says im good at this because im the ultimate laid back dog, who knew that I would be good at just sleeping. I enjoy going on nice walks and having lots of sniffs and seeing my friends, there is a big brown boy greyhound who lives near us called Rats and I love seeing him he gives the best kisses. I go on a lot of the Essex Greyhounds walks so a lot of you may have met me on them, if you don’t know me I will be the one that lays on the floor. I have done the last 6 GGGW (including when it was the GBGW) and the best thing is all the lovely greyhounds that come out on the walk with us and I get new stuff to wear and show off. I do like to show off, dad says I have become a diva as last year I got to be in a film ! I was in the movie “all the money in the world” directed by Ridley Scott and stared Oscar nominated actor Christopher Plumber and had Mark Walburg in it as well, the best thing about this was after the film was released Dad was telling the local paper about me because we could tell people lots of people what great pets we make and a national newspaper the Daily Express come down took lots of pictures of me and put me in their paper – so I am famous although my dad keeps calling me infamous cause I do like to get into trouble. We have a box on wheels we all going on our holidays in and it get very cosy in there, I love going away in it because I get to meet lots of new dogs when we are out and about, new dogs friends means new bums to sniff, I really don’t know why the slaves don’t try it ? Well I am getting tired of typing this blog thing, so I am going of to sleep, but don’t worry I will be back soon to tell you more of my stories and what I have been up to, plus giving you all the latest news and updates on the GGGW 2019 which is a extra special 10th anniversary but one last thing before I go for those of you who don’t know last year there was 100 worldwide walks and 98 UK walks which is totally fab but our world wide friends beat us to the most walks, currently we have 73 walks registered for this year while the worldwide walks are at 75 so come on the UK we can’t miss out for the second year, let’s get some more walks registered it doesn’t matter how big or small your walk is they all count, we had our own little walk last year and had a great day it is very easy to organise and you get lots of help off the GGGW team if you want some advise please ask us as well – so come on the UK “paws to the pavement” is my UK catchphrase so come on help us to bet the rest of the world this year with the amount of registered walks.